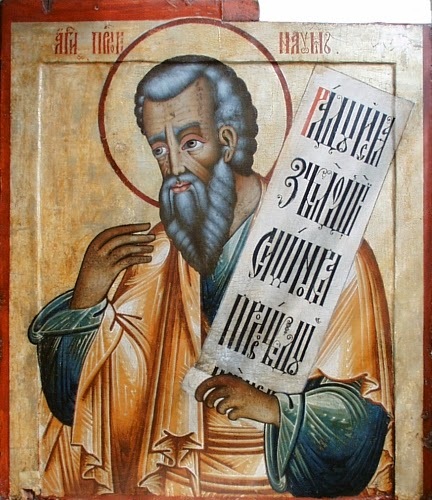 Prophet Nahum, not Dwight Longenecker. Why Nahum? Why not? The headline is the "prophecy" of Father Dwight Longenecker, whose blog, Standing on my Head, I visit regularly. I wish I could take credit for what he said, because it's things I've been thinking lately, but he said it first, and way, way better. > The battle over Vatican II is coming to an end. Before long, those who see things as "pre" or "post" Vatican II will have gone to their reward. Not only are the folks who see things that way "dying out, but their ideas are dying out. Their places are being taken by a younger generation of Catholics who do not remember the Vatican 2 wars." > This new generation isn't necessarily more "conservative" or "traditional," Father says, but are Catholic because that's what they want to be. And they are filling traditional religious orders and seminaries. > In the years ahead, the culture will become more aggressively hostile to our Faith. Although Father doesn't say this, I will: we may be stunned by how ferocious it becomes. But he does say, "As it becomes difficult and dangerous to be Catholic the complacent and comfortable Catholics will quietly slip away. They are doing so already." And I will add my own prophecy: this may be a more sizeable exit than people are ready for. > "As it becomes difficult and dangerous to be Catholic more young men will stand up to be counted. Men like the militant aspect of being a priests. They want to stand up for what they believe in without compromise. They want to fight the good fight with all their might. The Church militant will make a come back and an increasing number of men will step forward to be engaged in the spiritual battle." We may not be "flooded" with priests, Father Longenecker concludes, but they'll be strong, courageous priests. Absolutely. > The liturgy wars will begin ending faster than you may expect. As already mentioned, a certain generation is dying out; and the complacent are departing. Included in this departure (either form) will be the narcissists who have been demanding parish liturgies cater to their demands, as opposed to liturgy being what it truly is: a corporate act of worship and intercession, for those who realize their needs are fundamentally met by God Almighty and the sacraments, not mood-music Masses and lots of affirmation from all around them. They are less interested in a "table" to "gather around," but readily understand the need for an altar to kneel before. While this will be a trial for the "progressives" -- this process is already a trial for them -- many of the "traditionalists" will continue to be tried as well. There's narcissism there, too; and it won't be catered to. The Church is going to be too busy to do that. "Told you sos" may be merited, but it would be better to let it go. Many traditionalists need to prepare themselves for something new that will be good. Father, you've been reading Ratzinger's "Faith and the Future"? Actually, no. Care to expand on that? I think you hit the nail on the head. There is no doubt that the Church is in for some really hard times in the very near future. I especially agree with your supposition that "Cultural Catholics" will fall by the wayside. That is right on the money. You can see it happening already every day. We recently moved back to my wife's birth community after we both retired last year. We found our parish five miles down the road a little lacking in what I call "parish culture' from what we were used to, in fact, our priest, who shares three parishes within a 33 mile radius, rarely has the opportunity to say mass locally but once a week. The ladies are trying to start an Altar Society group; adoration one afternoon a week; but spirituality is lacking, and that is being kind. The young, mainly teenagers, rarely go to Mass even with the blessings of their parents. Families may attend twice a month, but always receive communion when they do attend services. Surely the priest must know that communicants are not attending Mass, they don't go to confession, no one does, but he allows them to receive the Body and Blood everytime they come to the altar. Father sits in the confessional, alone, virtually every Saturday afternoon 15 minutes prior to Mass. Although this type of lackadaisical catholic activities is pretty common, it is more noticeable in this parish. I have been wanting to talk to Father about what I see, but don't want to burn MY bridges with him since he is the only confessor I have. To remedy these issues, Father needs to communicate these concerns to his flock. I am afraid that Father will be held responsible for his not pointing out to his flock that it is indeed a sin to miss Mass; it is indeed a sin to receive communion with mortal sin on your soul. And to make his point more dramatic, he needs to have confession at least an hour once per week and not on the night of Saturday's Mass. What is your thoughts, Father? I do not see the gathering of the young in our parishes like is written in your story, I see the exact opposite in fact: old folks and a young priest who fails to see there is a problem. Amen. I hope you are correct about the 'liturgy wars' ending sooner rather than later, but am curious what you think is the "something new that will be good"? Sincerely, inasmuch as I am "narcissistic" I'm happy to have that purged away. Do you know Robert Hugh Benson's The Lord of the World? Evidently, it's one of his Holiness's favorite novels. Yes, I am the president of the National Pro Life Alliance. Thanks for any help you may choose to give! And when I referred to "something new that may be good," I just mean this: if indeed the Church goes through a time of trial and purification in the next 20 years, as Father Longenecker "prophesies," then that "new" Church will be a holy Church; and if, as I further prophesy, that experience will bring the "liturgy wars" largely to an end, then the resulting sacred liturgy will indeed be sacred. Yet it may not be a simple return to the Extraordinary Form. It probably will not be. That's why I say this may be a challenge for many traditionalists, who -- understandably -- are mighty skeptical of anything "new." It may take 100 years before the Roman Rite restabilizes after the disruption that followed the Second Vatican Council (note, I did not attribute causation! Beware of that pitfall.). But what should come in the near future, with the forecast of Father Longenecker, should be a much more Christ-focused liturgy, supported by faithful more interested in actual worship of Him, as opposed to all the narcissism I referred to. Is that not something you would call good? My thoughts are that you need to talk directly with the priest you refer to. You should be able to have a friendly conversation, in which you share concerns. There is a right way and a wrong way to do it. Thanks for making me aware of Fr. Longenecker's site. Yes, along with the Mormon Church, the Catholic Church is fast becoming a refuge for dissenters. Thank you, Fr Fox! Oh, yes, I call all that good. I personally prefer the vetus ordo to the new as it is usually celebrated, yes, but I also happily await the day-- after our lifetimes, perhaps, but also as you and Fr Longenecker suggest it may come very quickly due to other causes-- when the stabilisation has happened; I'm not one of those who thinks the novus ordo will ever be simply suppressed, or that the vetus can't be reformed in an 'organic' (whatever that buzzword actually means :-)) sort of way (the calendar, commemorations, an augmented lectionary etc etc). When we can speak openly of the great mess of nonsense made by the Consilium, that will be a good thing, too. Very interesting post! So to use a Game of Thrones analogy, are priests more akin to taking the black and protecting the realms of men? Well, I have not seen the show, so I cannot comment on the analogy. I see little cause for hope. My parish has received two new young priests over the past two or three years. They are every bit as politically correct and anodyne as their older brethren. Our parish music is still infested with Marty Haugan and David Haas (how's that for traditionalism? Haugan-Haas now in its 20th year!). The architecture is still appalling in the area. People have been promising a new springtime Real Soon Now (™) but I just don't see it.